This surname is of Anglo-Saxon origin, and may be either a topographical name from residence by an enclosure, deriving from the Olde English pre 7th Century "haga", cognate with the Old Norse "hagi", hedged field; or locational from Haigh in West Yorkshire, or in Lancashire. Both of these places were recorded as "Hagh" in the Pipe Rolls of the respective counties, dated 1194 - 1198, and are named from "haga" or hagi" (as above). Topographical surnames were among the earliest created, since both natural and man-made features in the landscape provided easily recognisable distinguishing names in the small communities of the Middle Ages. Locational names were originally given to the Lord of the Manor, or as a means of identification to those who left their place of origin to settle elsewhere. The surname first appears on record in England in the early part of the 13th Century (see below). Petrus del Hage, whose name occurs in Scottish documents, dated 1160, is believed to have originally come from La Hague in Manche, Normandy, named from the Old Norse "hagi". 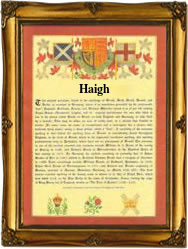 In the modern idiom the name is spelt Haig, Hague and Haigh, the last mentioned form being most widespread in Yorkshire. On April 19th 1545, Alice Haigh and William Wilson were married in Halifax, Yorkshire. The first recorded spelling of the family name is shown to be that of Jollan de Hagh, which was dated 1222, in the "Close Rolls of Yorkshire", during the reign of King Henry 111, known as "The Frenchman", 1216 - 1272. Surnames became necessary when governments introduced personal taxation. In England this was known as Poll Tax. Throughout the centuries, surnames in every country have continued to "develop" often leading to astonishing variants of the original spelling.